Product quality and customer service are a self-evident priority within the operational management of Delta Mossel. That is why Delta has set up an extensive care system in which the risks to the safety of the products are eliminated as much as possible. 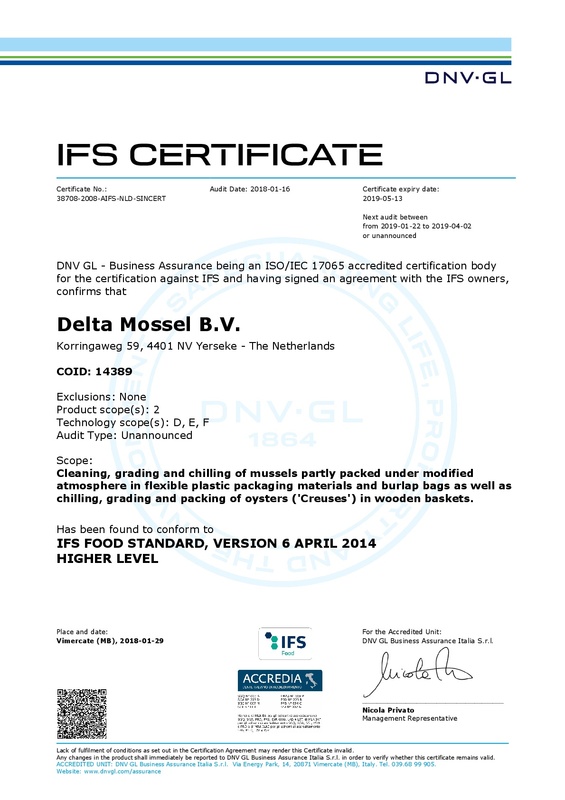 There are a number of issues that Delta Mossel strongly bear in mind when achieving this goal. Integrity of the product: Quantity declaration, the declaration of ingredients, the correctness of the label and complying with the Commodities Acts are involved. Integrity of the production process: All aspects as expressed in corporate responsibility and the employer’s social responsibilities towards his employees is an important criterion in our operational management. 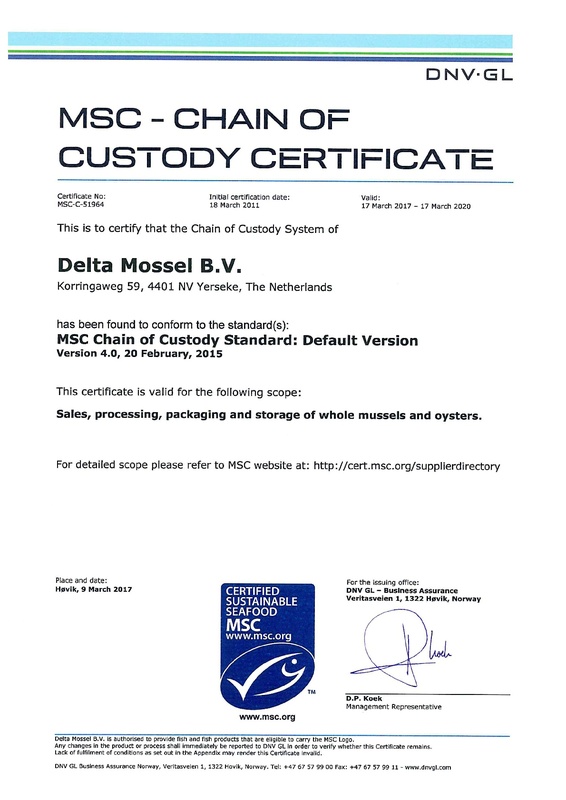 Sustainability of the company: Sustainability of the company, but also sustainability of natural resources from which Delta Mossel purchases its products. Packaging and distrubution: Indemnify the product against external influences in order to maintain a good quality. Correct weighing while packing the packing according to e-sign. Our packaging and labeling make the product recognizable and traceable. The packaging contains a protective gas atmosphere which is an essential part of the preservation. Product development and innovation: At Delta Mossel we are constantly looking for innovations with the aim of efficient business operations at the factory, fewer risks of contamination of mussels and oysters, and improved working methods for employees and less environmental impact. One should also consider aspects such as mussels and oysters from sustainable fisheries and cultivation, energy-efficient, safe low-noise machines, easily biodegradable disinfectants, but also far-reaching waste separation, recyclable packaging material and a safe working environment. 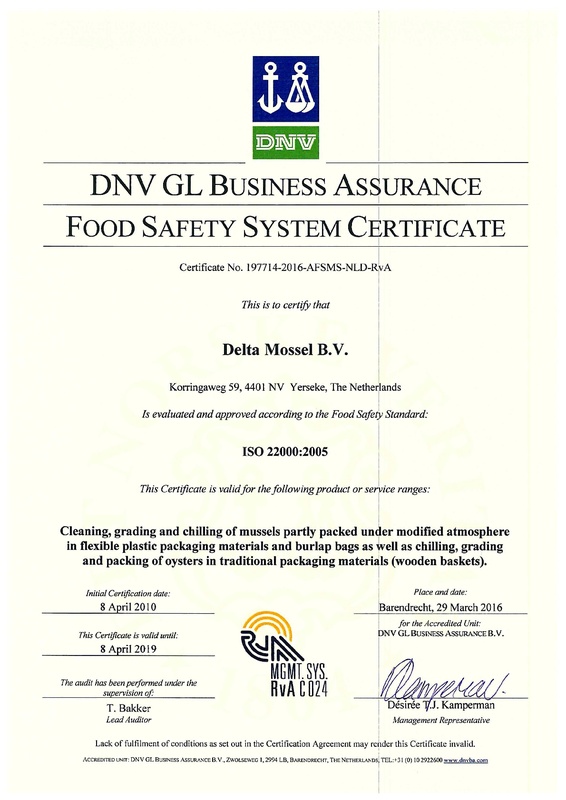 Food safety: Delta Mossel has a care system with regards to food safety according to the so-called HACCP concept. On the basis of an evaluation of all food safety risks associated with shellfish processing, a care system has been formulated with which these risks have been reduced to acceptable proportions. The delta food safety plan has been certified with a specific HACCP certificate in addition to the government’s regulatory approval.